Hi! 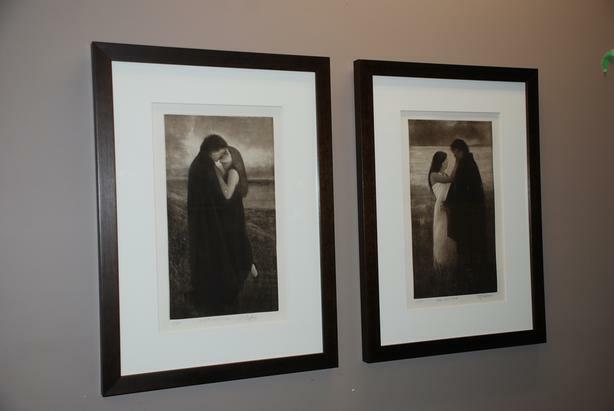 I have for sale two original Canadian works of art - a matching pair of etchings in sepia tones. One is entitled Night And Day and the other Time And Tide. They each measure 26" x 19" including the frame. The photos included with this ad show these works-on-paper both cropped and uncropped before they were framed as well as framed hanging on a wall in a home and in an art gallery. These two romantic scenes celebrate the beauty of two timeless lovers by the sea. These are collectible works of Canadian art in themselves but they are can make meaningful and significant gifts symbolizing love and devotion for Saint Valentine's Day, a wedding/anniversary gift, a shower present, a significant birthday, or something special for Christmas. Or businesses can invest in Canadian original art as an asset. These etchings are not reproductions: they are original works of art painstakingly printed by hand one-by-one by the artist personally. Each comes with its own Certificate Of Authenticity stating the full appraised value ($675.00), the creation date, the artist name, etc. Also, I have considerable informational material about the artist and the etching process as well to give to the purchaser. Night And Day and Time And Tide have both been professionally framed in the same way using archival standards. The moulding (the wood part of the frame) is called Brownstone/True Brown. It is mahogany colour and the grain is visible in the wood. Also, there is picture glass and a raised 3" mat in an eggshell colour. The frame is wired on the back so it is ready to hang. Again, the authenticated price of each individual etching is $675 and I will include in this sale the documentation to prove that. I am asking $550 for each etching - $125 less than its appraised value. I will sell each work separately or together as a pair. I am an art dealer but these two are part of my personal collection. I am located in Vancouver, BC but shipping is no problem. I will be happy to mail these etchings to you using CanadaPost and Interac bank transfer. So, if you are interested in purchasing, e-mail me and we'll figure out the logistics and/or I can answer any questions you may have. Thanks!